It’s amazing how much difference a year makes. If one were looking for the Panthers to be as busy as they were last July 1st, then they would be surely disappointed. But thanks to last summer’s signing and trading frenzy, Florida didn’t have to be. 365 days following a day that saw the Panthers add eight new players to their roster (one via trade) on the first day of free agency, Florida wasn’t as busy in terms of quantity but focused on quality instead. The club resigned three of their own and dipped their feet into the free agency pool for another three once noon hit. Three of the players signed will bring organizational depth and most likely play in San Antonio. With 16 players under contract already, Tallon was focused more on adding while leaving space for young players such as Jonathan Huberdeau and Quinton Howden to make the jump from juniors or other lower leagues. “We’re trying to get better every day. Sticking to our blueprint and allowing an opportunity with a strong group of veteran guys to allow your young guys to fit in when they’re ready,” said Tallon. The Panthers got the ball rolling just before noon hit as they re-signed goaltender Scott Clemmensen to a two-year deal and restocked some of the organizational depth in the resigning of center Greg Rallo and goaltender Dov Grumet-Morris to one-year deals. It was really a no brainer to both parties in bringing back the popular netminder. Clemmensen had his best season with the franchise since signing a three-year deal back on July 1, 2009. He posted a 14-6-6 record with a .913 SV% and a 2.57 GAA in 30 games. With the impending departure of Jason Garrison, who signed Sunday night in Vancouver, Florida took care of shoring up their blueline in bringing back a former Panther as they inked Filip Kuba to a two-year deal. Kuba, who recorded 32 points while playing with Ottawa this past season, was an eighth-round pick of the Panthers back in 1995 and spent his first two seasons with the franchise before playing for Minnesota and Tampa Bay before suiting up for the Senators. In what can be seen as the two-for day, the Panthers once again signed a player to a two-year contract, inking enforcer George Parros. The former Duck brings a lot of passion to South Florida and isn’t afraid to stick up for his teammates as he holds Anaheim’s record for penalty minutes with 812. Scott Clemmensen watched the direction of the Florida Panthers change with a roster overhaul last summer. And because he believes better days are ahead, he's not leaving anytime soon. 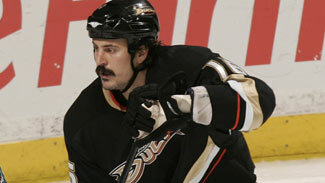 “The Panthers showed a lot of interest early on,” said Parros on a conference call following the signing. “They expressed a great desire to have a guy like me in the locker room. With the coaching situation and all the talks that I had with everyone, I had a chance to play and contribute. Florida added a third forward to the organization as they signed Jon Rheault to a one-year contract. What Tallon noticed about the day was that it was a far cry from years past. This year, it was the Panthers that were receiving the calls from players trying to come to South Florida. The players that signed noticed the change in culture as well. And even though the Panthers came to agreement on contracts with three regulars, it doesn’t mean that they’re done in free agency. While still giving a chance for their young guns to make the team out of training camp, there’s always a possibility to add. Tallon is known for tinkering with his roster, whether it be July 1st or August 15th or even November 28th. “We’re still not done yet. We have a long summer ahead of us. We’ll see what happens,” said Tallon.